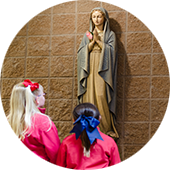 FIAT – Faith In Action Together – is an STM Catholic School parent ministry that strives to mobilize parents, students, and families to grow closer to our Savior, Jesus Christ. Our mission is to come together as one – school and greater parish community – to live out our faith with support and love for one another. FIAT strives to provide opportunities and to promote other parish ministries that will foster a strong faith through ACTION. As Jesus, Mary and Joseph said “yes” to their earthly mission, let us strive each day to accept God’s calling for us in our lives. Parents in Prayer – Friday Mornings 8am, usually in the Small Cafeteria in school. Parents in Prayer is a parent-led prayer group where we pray for the needs of our school and parish family. On specific days we will pray for the intention of a particular grade or we will pray the rosary. We are a visible reminder to our children of the power of prayer! Small children are welcome! Advent by Candlelight – November – Each year, FIAT hosts an extraordinary evening of food, music, and fellowship. We hear from an inspirational speaker who helps focus our sights on the prayerful time of Advent. This event regularly draws over 200 people and is offered free to STM parents and parishioners. Mardi Gras Luncheon and Reflection – Tuesday before Ash Wednesday – This event prepares us for the 40 days of Lent. FIAT provides music, food and a dynamic speaker who inspires us to live the faith during the most solemn season of the liturgical year. Enjoy fellowship and learn how to better practice prayer, fasting and almsgiving. Help & Caring – as needed – Our community is certainly not immune to the ever-changing world. In the event of a birth, death, serious illness, or financial difficulties, the STM Catholic community comes together to provide help and caring. We will schedule meals, offer prayers, communion in the home and any help needed. Families need only reach out.